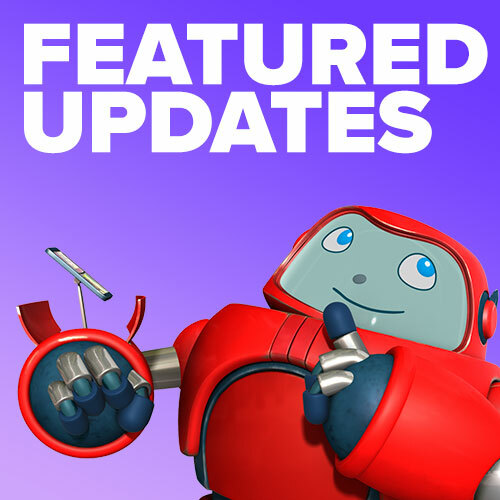 GIZMO AND TEAM HAVE BEEN HARD AT WORK MAKING SUPERBOOK ACADEMY MORE USEFUL AND EASY TO USE. WE ARE SO EXCITED TO UNVEIL OUR NEW FORMAT! Airplay a video to Apple TV: With your device connected to the same Wi-Fi network as your Apple TV, start playing a video and tap the AirPlay icon in the lower right-hand corner of the player. Just like that, your selected video will begin playing on your TV! Cast a video to Chromecast: With your device connected to the same Wi-Fi network as your Chromecast, start playing a video and tap the Chromecast icon in the lower right-hand corner of the player. In mere moments, your selected video will begin playing on your TV. You can continue browsing Vimeo on your device while your video plays, and control playback on your TV using the Chromecast controls at the bottom of the app. Save videos to your Vimeo App: To watch videos from your Watch Later queue, click the clock icon at the top right of a video. After logging in to your Vimeo account, you will be able to add the video to your “Watch Later” list. Downloading videos for offline playback: When viewing a video in the Vimeo App, tap the ellipsis next to the video you want to download and touch “Make Available Offline.” Your video will begin downloading to your device, and you’ll see a progress bar appear. Once the download has completed, you can find it under the Offline tab of your Playlists. You can also download a video while in the player view by tapping the Download icon. Downloaded videos are only available for playback within the Vimeo app, and cannot be accessed by other apps. To remove a downloaded video, go to the Offline tab of your Playlists, tap the ellipsis, and then tap “Remove from Offline.” Videos can also be removed while in the Player view by tapping the blue Download icon. Lesson Overviews: The Lesson Overview is a simple one-page outline of the main sections of the lesson including supplies needed for each activity. Discussion Questions: Each lesson includes questions to engage kids in a discussion about the Bible story and SuperTruth. This PDF has all the lesson’s questions compiled in a one-page list. Additional Resources: These activities are not exclusively used in the lesson but can be used to support the lesson’s learning objectives. Each activity or craft is created to allow your students to do them independently without a guided lesson. These activities can be used at any time during your teaching time, or even before class while you are waiting for all of your students to arrive. GizmoNotes: The take-home page for each lesson is the GizmoNote; it highlights what the kids learned in class and will remind kids to discover more fun games and activities with the Superbook Bible App or online. We pulled the GizmoNotes up to the right column also, for you to find quickly. GizmoNotes can be printed and handed out or emailed. New simpler format: One of the most significant visual changes is the actual layout! We compiled all the lesson printouts and activities into a simple category called “Lesson Resources.” We did this for a few reasons, but for you the teacher, it means now all the relevant crafts, and printable are linked in the text of the lesson! Now you can quickly access the right PDF when you need it!